CALL FOR PRICING and ORDERING!!!! 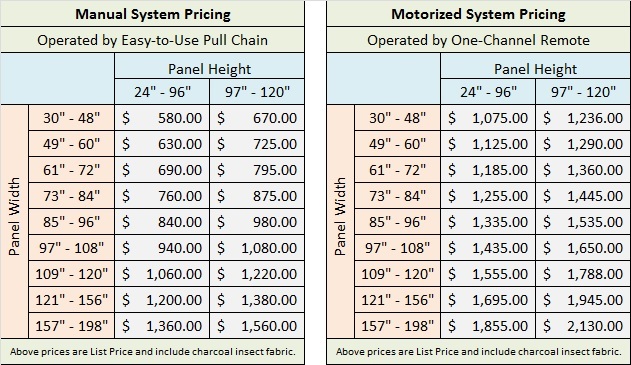 For detailed pricing and to place an order for the Olympic Screen please call 1(800)654-4577 ext 234. The Genius Olympic Pull Down Retractable Screen is ideal for openings up to 16.5 feet wide and 10 feet tall. operated by a portable and easy-to-use remote control. Available in a manual version operated by a pull chain or a motorized version operated by a portable and easy-to-use remote control. Wind-Sun Sensor – will automatically adjust the screen according to programmable wind and weather conditions. Screens under 100″ will ship via parcel mail. Screens over 100″ will be shipped via LTL carrier. The minimum freight charge for LTL carriers is $150 per order. PLEASE NOTE: Colors displayed may appear different than the actual color depending on your monitor’s color settings and resolution. This is a custom item by adding this item to your shopping cart you verify that all sizes and information are correct as listed.